eNoah is a customer focused Revenue Cycle Management partner with over a decade experience in delighting customers & offers unique engagement models that fit your specific needs. Our team of competent & experienced specialists strive hard to deliver Great Quality in a timely & consistent manner. 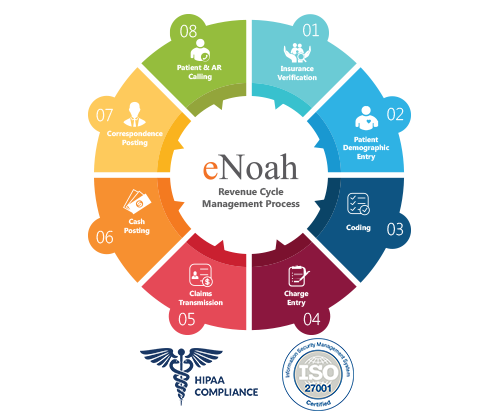 eNoah is HIPAA compliant & ISO 27001 Certified. Talk to us to know more about our RCM Services. Contact Us ! Our teams perform revenue cycle management functions with laser precision backed by years of productive efficiency guaranteed to provide reliable results for you eliminating time and cost waste. This helps our partners achieve sustained growth by focusing on the core. Most companies do not offer the singular attention and focus that eNoah’s specialized RCM Professionals bring to the table.We employ powerful business intelligence tools to hone in and improve every aspect of your billing and collections efficiency. eNoah has tailor-made programs with partial resources who are trained for both business functions. You pay only for half FTE to handle the transactions. If you have volumes beyond half FTE but less than full FTE, we have unique engagement where you will pay only for half FTE with transaction based pricing. Contact Us to know more about our Engagement Model ! 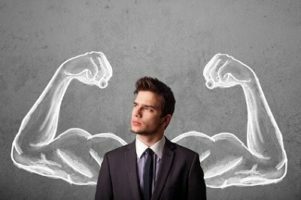 eNoah’s Revenue Cycle Management Offerings? Following an appointment at the doctor’s office, we complete the Patient Demographic Entry by collecting and verifying the patient demographics received at the Patient visit. In the event that the patient is already registered in the medical billing system, new information is verified with the existing data and changes are swiftly updated. Receive Patient information from clients and billing offices. Verify the patient’s insurance information. The best way to get a claim paid on time is to conduct a proper Insurance Verification before the service is rendered. Receive Schedules of the patient via EDI, mail or fax or check them every day in the appointment scheduling software. Update the billing system with eligibility and verification details such as member ID, group ID coverage period, and co-pay information and other benefits information. Our Medical Billing professionals enter charges based on standard medical billing rules pertaining to each specialty, insurance carrier and the location. The charges are created within the agreed time frame -generally 24 hours Turnaround Time. Our charge entry team is well trained to work with numerous medical billing software, packages like Misys Tiger, AdvancedMd, Practicemate, Practiceadmin, Ezclaim, SequelMed, Medisoft, Medtron, MD Net. Charges are entered into the client’s medical billing system based on account specific rules. The pending or held documents are sent to the client for clarification, on a pre-determined schedule. The final charges are audited by the Quality team and the Clean claims are filed. A crucial step in the Medical Billing process is Claims transmission. The claims contain sensitive information including patient data and insurance information. Claims transmission through electronic submission reduces processing delays and ensures high readability. This guarantees that no claims are rejected due to illegibility. With electronic submission, the carrier confirmation report is also instant and prevents any time delays due to transmission. Tracking claims have also become easier and corrections can be made to the claims thus avoiding rejection. At eNoah, payments received from patients and insurance companies are posted to the patients’ accounts in the client’s billing system. The posted payments are balanced against the deposit slips to ensure accuracy in payment. We also process electronic posting of payments into the billing software and ensure that the EOB (Explanation of Benefits) files are stored for future reference. The payment posting team also checks for any underpayment being made to the accounts and move the accounts to the Accounts Receivable team for reprocessing. Denial Management is critical in the process of medical billing. Our dedicated team of denial management experts execute a thorough analysis of the denied and underpaid claims to determine the reason behind the denial or underpayment. Corrective measures are taken on the basis of the analysis without any time delay, and the claims are re-submitted for acceptance of the insurance provider. After re-submission, the denial management team regularly follows up on the claims with the insurance provider to track status and expedites the payment. Collection of Funds- Receivables, is a challenging task. 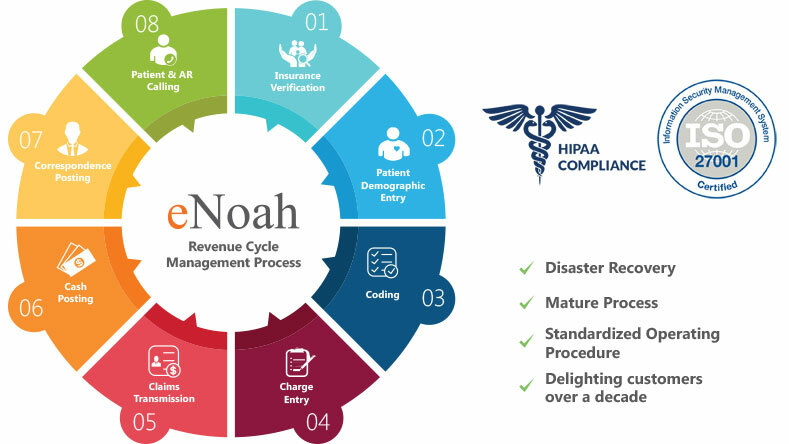 eNoah employs the industry’s proven professional and efficient strategies to recover receivables and also excels in converting aged AR receivables into collections by effective follow-up with insurance providers. A dedicated team of AR Callers follow-up with patients to get missing patient information by sending emails, notices or making phone calls. Insurance companies may apply a portion of the allowed amount to patient responsibilities eg.Co-Pay, Coinsurance, and Deductibles; Our billing professionals review accounts which have an outstanding balance after insurance payments, and print patient receipts in the client system. As per the client’s requirements, we perform Small balance adjustments, Bad Debt Adjustments, Sending Discount Letters and Courtesy Adjustments.